Here are a few photos from Etowah, TN. My family is still learning our way around our new area. Fortunately, the town is directly on Hwy. 411 so even I couldn't get lost... this time. I enjoy visiting out of the way spots that have historic interest. Etwoah delivers in spades. In the meantime, here are some photos of the town. If you are a traveler who is looking for a charming peaceful town to visit this town is it. Etwoah is called an antique shop and bargain shopper mecca. I am looking forward to going back very soon. 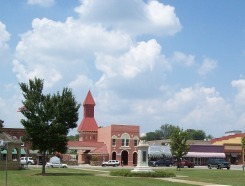 Historic main street offers several photo opportunities. Be sure to bring extra batteries or pick them up when you get there.